This was the 9th year for this event, and the 5th year in a row that Ken ‘Flex’ Wheeler has won this event. He showed up in the best shape of his life – 229 lbs on his 5’10” frame – fuller yet as wickedly ripped and detailed as ever. 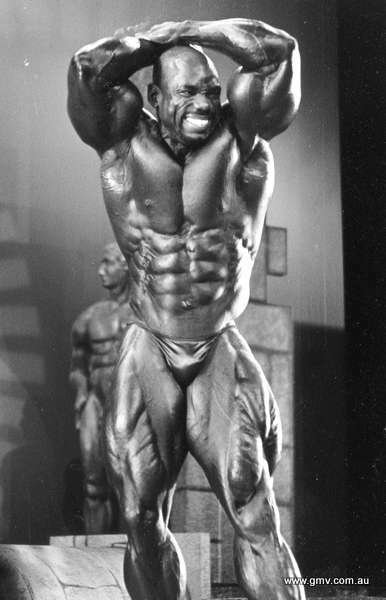 His arms were said by many to be the most perfectly shaped in bodybuilding at this time. 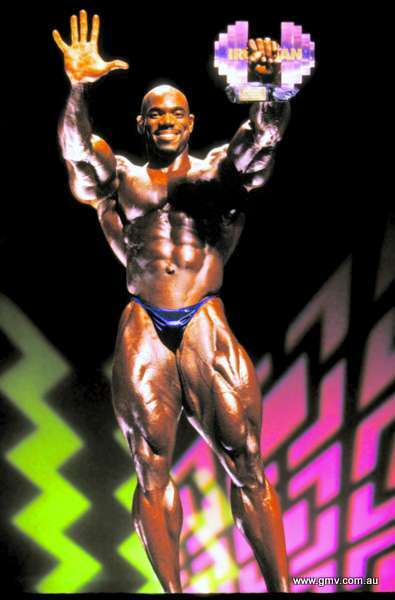 FLEX WHEELER showed up in the best shape of his life – 229 lbs on his 5’10” frame – fuller yet as wickedly ripped and detailed as ever. 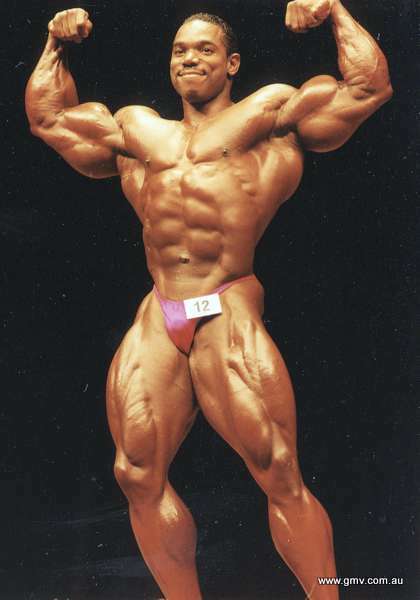 His arms were said by many to be the most perfectly shaped in bodybuilding at this time. Darrem Charles scored a close 2nd over Aaron Baker, and all 3 qualified for the ’98 Olympia. (The DVD also includes some prejudging highlights). There is not a lot of video footage on Aaron Baker of huge arms fame, making this DVD one of the best records available on him. 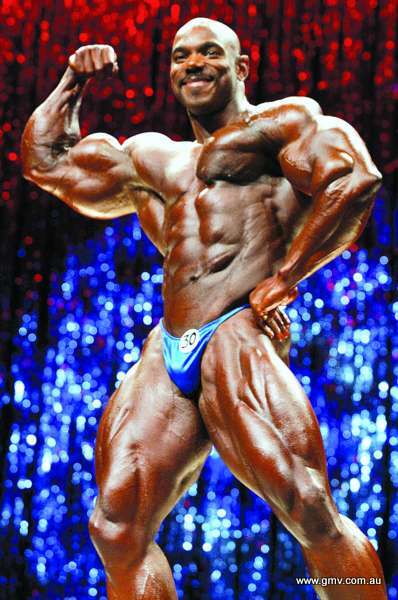 This was the 9th year for this event, and the 5th year in a row that Ken ‘Flex’ Wheeler has won this event. The evening show started off with a tribute to Vince Gironda, who died last November, three weeks shy of his 80th birthday. IM publisher John Balik and Vince were close friends, and John was planning an 80th birthday bash for him. 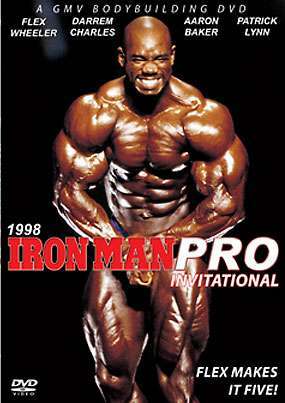 In the audience were notables such as Francis Benfatto, Alq Gurley, Barry Kabov, Paul Dillett, Gunther Schlierkamp, Lee Priest, Shawn Ray (first Iron Man winner), Mike Christian (Iron Warrior), Tony Pearson (former Mr. Universe), Larry Scott (first Mr. Olympia), and many more. Anthony Williams and Fauzi Hanst were disqualified later after failing the diuretics test. Slated to appear but did not show were Jeff Poulin (USA), Jocelyn Cadieuz (Canada) and Federico Focherini (Italy).